TEDxAmsterdam is all about practice what you preach, so when we promise Ideas Worth Sharing, we want to make this sharing as easy as possible. For all TED fans worldwide Deloitte and World of Minds will be facilitating ‘livemindmapping’ from the simulcast location at the top floor of in the ‘Maastoren’ in Rotterdam and of course you can also keep updated online. [infobox title=”Info Box” align=”left”] Read the full article at the TEDxAmsterdam website. [/infobox] Together with a team from World of Minds and with the use of MindMeister technology I am am present at the simulcast location at Deloitte Rotterdam. November the 25th 2011 I will be one of the mind mapper that will be live mind mapping from 9 till 21 hours. 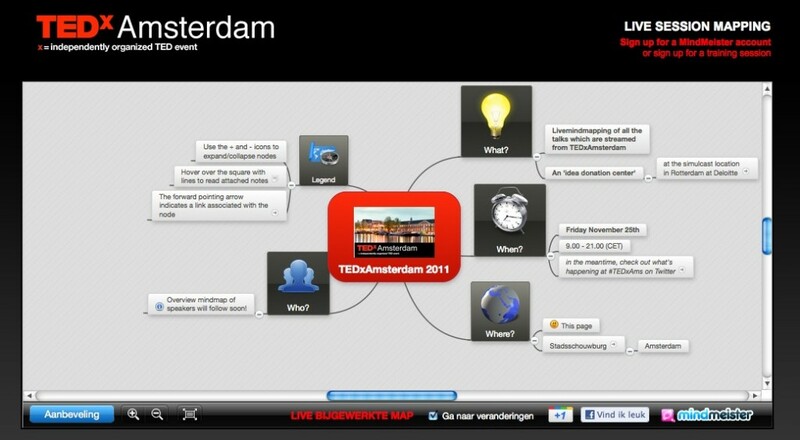 After live mind mapping TEDxAmsterdam2009 & 2010, TEDxRotteram 2010 & 2011 and TEDxGlobal I am looking forward to the interesting programme of TEDxAmsterdam 2o11; Theme Human Nature. These online mind maps will help you to follow the talks in main and subtopics while keeping an eye on the whole picture and will stimulate you to make new connections and thus new ideas worth spreading yourself! Click on the image to see the live mindmapping stream! Have a look at some other LiveMindMapping events I have done in the past. If you are interested in live mind mapping, please contact me.